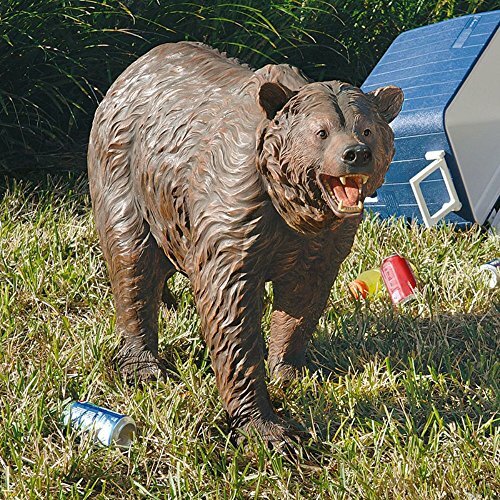 Fun Outdoor Bear Statues for a Bear Lover's Home! Cool and Unique Home Decor! 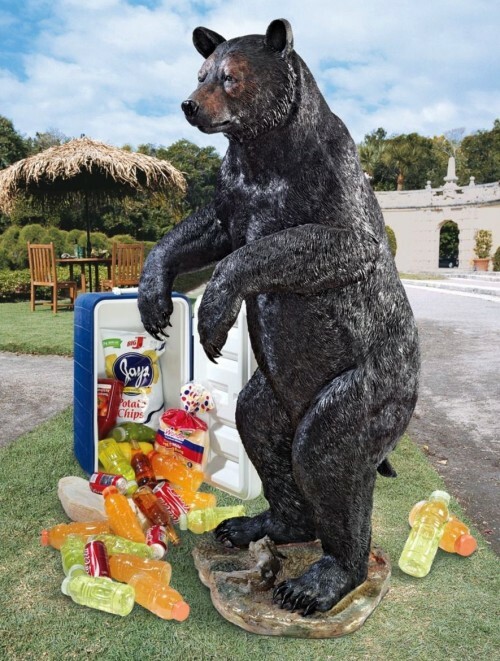 You won’t believe these bear sculptures for sale! Have you ever seen a tall bear up close? What would you do if you found yourself right in front of a menacing standing growling ferocious grizzly bear baring his teeth and coming your way? *Did you know that there are only eight bear species alive today but six of them are close to extinction? The brown bears are the largest bear species around and some can weigh over 2,000 lbs! They are magnificent creatures and many people would love to have a realistic looking life-sized bear statue in their garden! *Would you like to learn more about grizzly bears? Black bears are the most common bears found here in the United States and they love climbing trees and steal our food! (I say that specially because I live in Florida and I have seen many of these invading homes to look for food…I even saw one inside a family’s pool, having the time of his life swimming, while the kids watched from inside the house…) They also run pretty fast, up to 30 miles per hours. 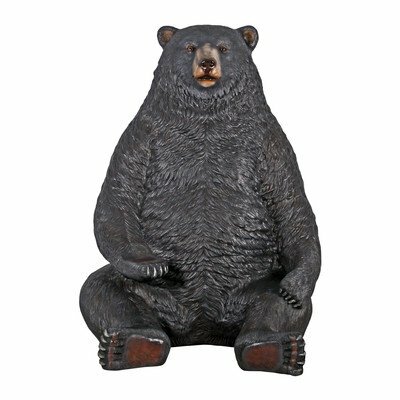 This realistic sitting black bear statue is one of the largest bear statues for sale I found! He is over 7 feet tall and two people can actually ‘sit’ on his bear paws! You can also get it in brown or white if you prefer. He was cast in quality designer resin reinforced with fiberglass. *Did you know that there are hundreds of black bears living in Yosemite? I swear to God, if I saw this gigantic standing black bear statue in my neighbor’s garden I would run for my life screaming from the top of my lungs! Look at his paws and his facial expression! He stands 60 inches tall! Everyone will want to take a picture next to him after they get over their initial shock that this is not a real bear and they are not about to be mauled to death! *It’s fishing time! It’s a very cute fishing bear sculpture! How would you like to have a cute bear fishing in your pond? 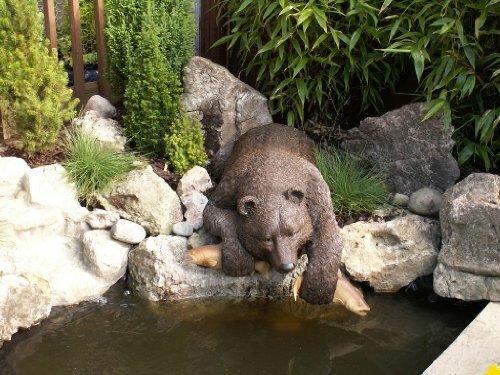 This is one of the cutest outdoor bear statues for sale around in my opinion! It is a very cute and very busy young bear fishing sculpture! Perfect to have by your pond, just like in the picture! He is of medium size, made from resin and all hand-painted. The price is not so bad either! *Here comes mother bear and her cute cub bear! 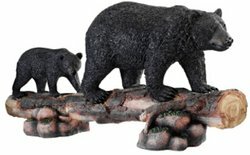 How absolutely adorable is this black mother bear and her cub walking on a log outdoor statue for sale? Isn’t it perfect to have in your backyard near a tree? It is a very well-made piece, all hand-painted for more realistic details! Adorable Sitting Black Bear Eating Fish Statue! How absolutely adorable is this? He just caught a big fish and he is hungry! 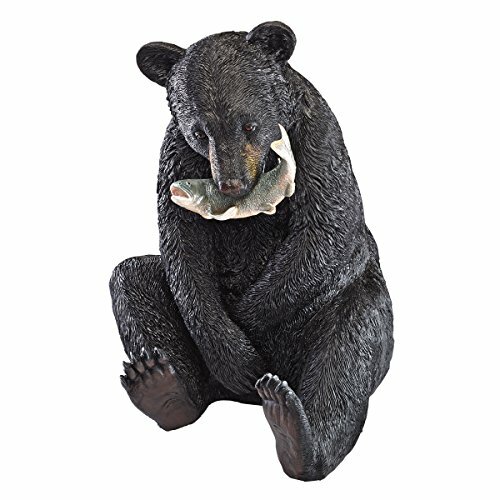 What a cute and fun young black bear eating fish statue! 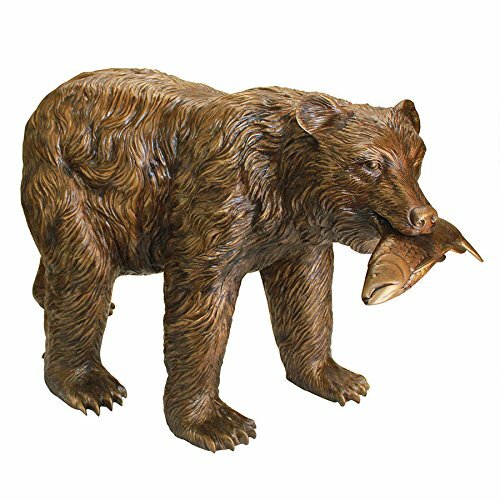 This cool fishing bear bronze statue can also become a fountain, as he has also been piped to cascade water from his mouth into your pond. You would need to get a 725 GPH pond pump kit (which is pretty cheap) to create a very cool ‘fishing bear water fountain’! He has a beautiful sepia patina hand finish! I think the price is fair for the size and the quality is excellent, as it was created by Design Toscano, a great maker of beautiful statues, figurines, fountains and gorgeous decor. Will look awesome in the backyard and I think it would also make an ultra-cool (and very unusual) gift idea for a bear lover! 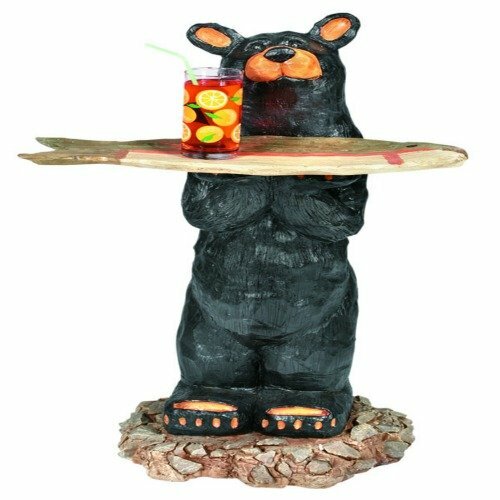 Fun Bear Waiter With Tray Outdoor Decor! Look who is eager to serve your favorite beverages while you enjoy yourself outside! If you are looking for a fun bear statue for your home today, I think you are going to love this bear waiter with tray sculpture for sale! Perfect piece to have by your pool or barbecue grill! Let this fun bear waiter hold your cold drinks for you! 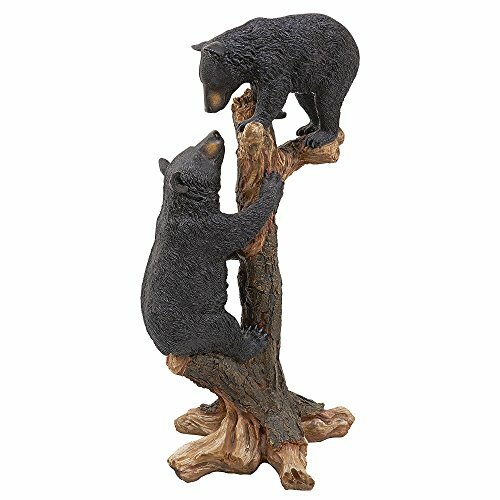 Cute Climbing Black Bear Cubs Statue! What a cute, fun and adorable black bear cubs statue for sale! Two black bear cub brothers are climbing a tree together! What a fun piece to have in your garden or backyard! 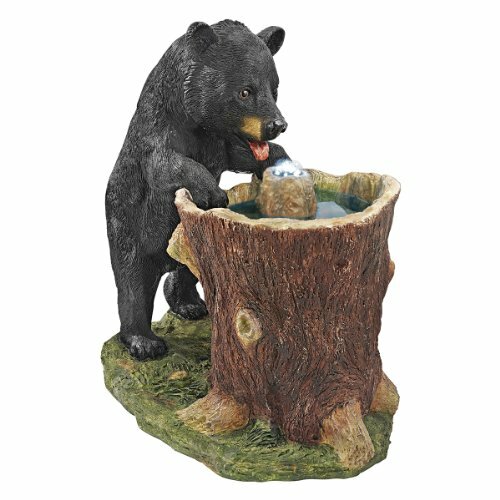 *Cute Guzzling Gulp Black Bear Garden Fountain! It seems he is thirsty! It also comes with the pump! Now all you have to do is find the perfect spot outside for him! Realistic Life Size Animal Sculptures! Help I am looking for a black bear that you can put on a tree limb or the trunk of the tree .The bear looks to be climbing . Hi Denise, thanks for visiting! I will keep an eye out for something like this! GabrielasHome is a participant in the Amazon Services LLC Associates Program, an affiliate advertising program designed to provide a means for sites to earn advertising fees by advertising and linking to amazon.com. **The owner of this website, GabrielasHome, is also a designer associate at Zazzle and as such, receives compensation for sales that are generated by her affiliate links.